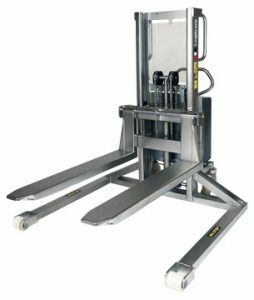 Logitrans announced its stainless steel straddle stacker designed for handling closed pallets in environments with hygienic requirements. This stainless steel straddle stacker is corrosion- and acid-resistant, and made from electro-polished AISI 316L stainless steel. The closed forks facilitate cleaning and minimize the risk of bacterial contamination.